Not really sure who wore these clothes, but they’re pretty, right? 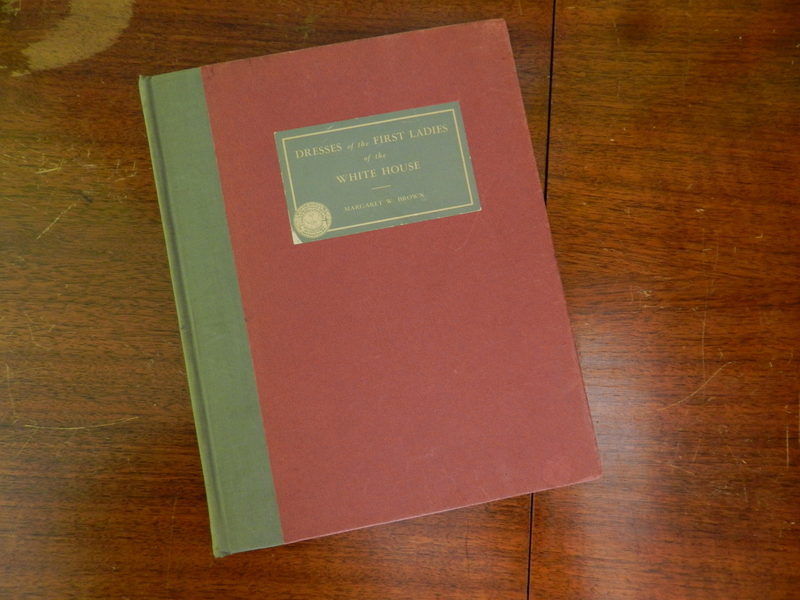 This small book was written by Margaret W. Brown, associate curator of the Department of History at the Smithsonian Institute, and published in 1952. 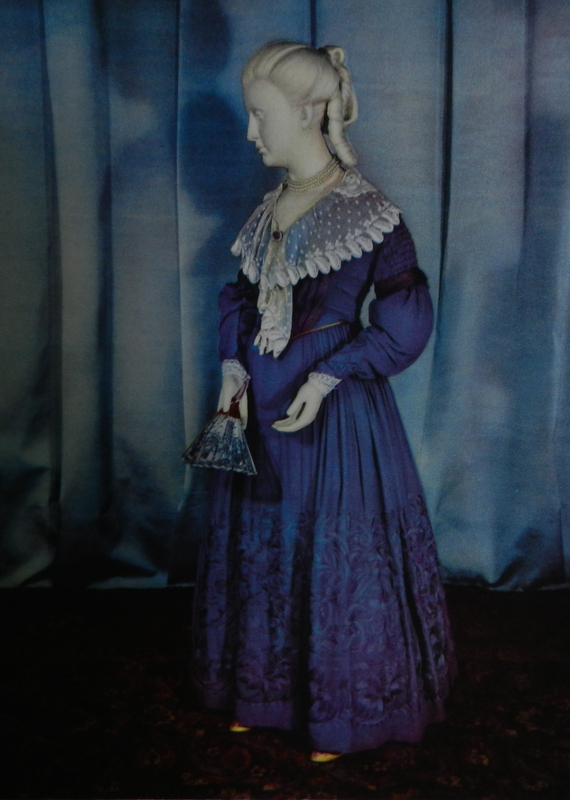 Portraits of many first ladies, some first daughters, and some assorted female hangers-on are expanded with a mannequin dressed in something owned/worn by them/another woman from the same century they lived in. A dress purportedly worn by Abigail Adams, who died in 1818. I’m assuming she wore this dress on All Hallows Eve at least two decades later. Whoooooo spooky. 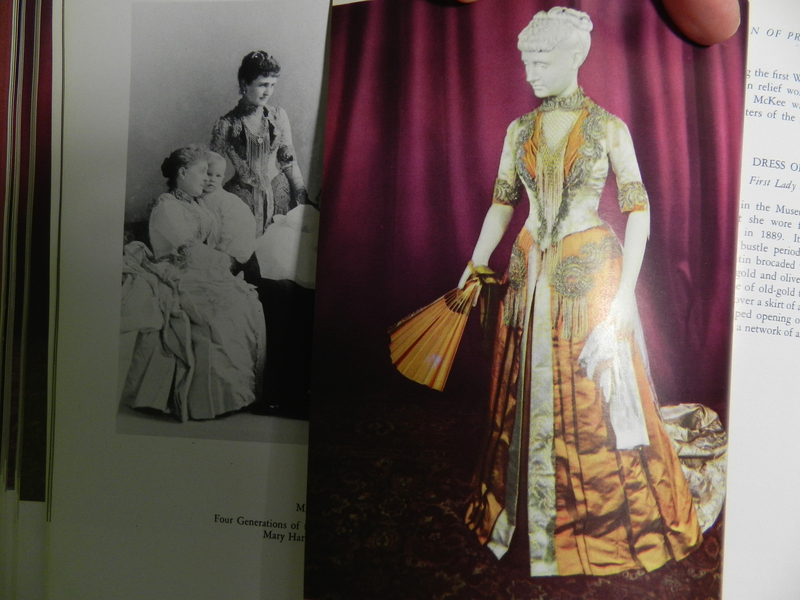 This “saque period” dress shows the worst of this poor outdated book. 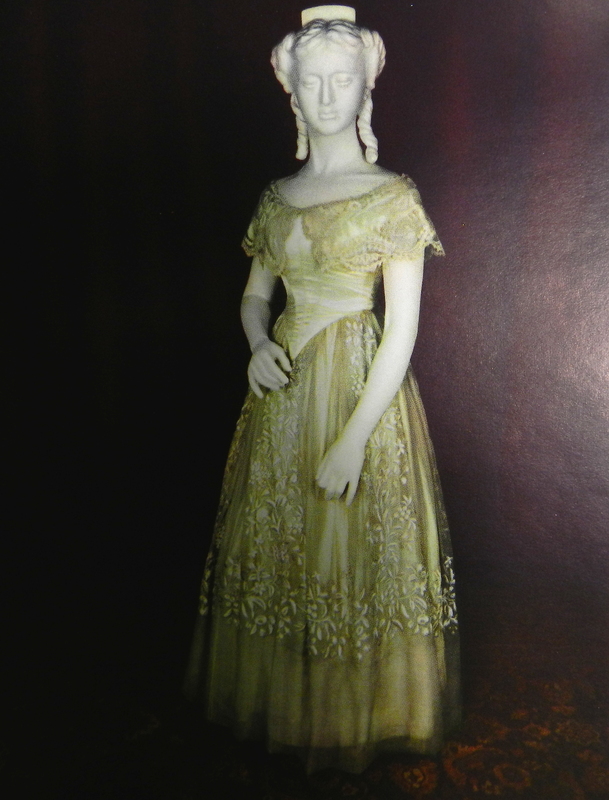 The book claims the dress was worn by Elizabeth Kortright Monroe, who died in 1830. What we’re looking at here is an interesting example of a re-made gown. I think the original gown dates to the 1760s, but look at the added gathered bit at the front chest. That’s probably a late Victorian addition for Centennial wear – along with the contrasting robings and whatever’s going on with the petticoat. Anyway, since Mrs. Monroe was born in 1768 she probably never wore this gown in either incarnation. 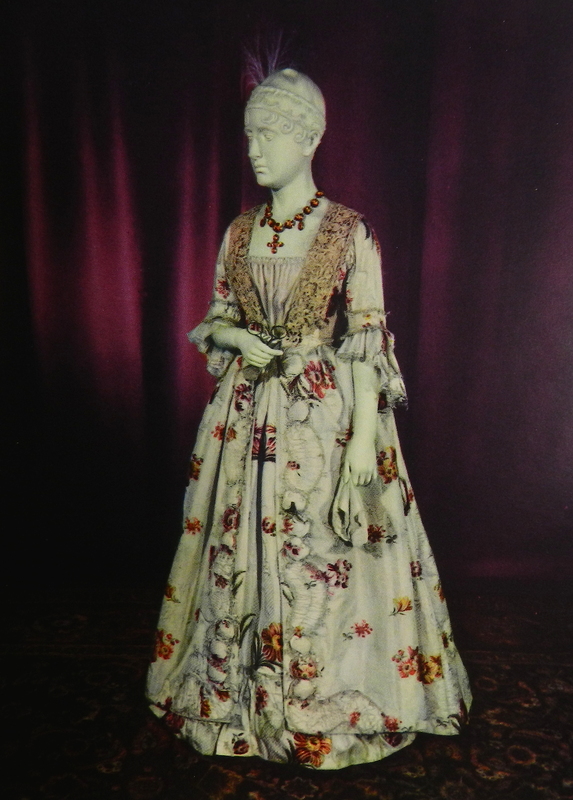 This gown is said to be Maria Gouverneur’s, who is said have worn it before 1850 … unless she too wore it for her yearly haunting … yeah, more likely. It’s got a “Watteau” back, and a narrow skirt. It’s probably a fancy dress/costume piece for the Centennial in 1876. In addition to the “Watteau”-ness, note the long V-style front – a take-off from 18th century stomachers. Many 18th century aesthetics (and gowns, as above!) were repurposed for the Centennial, and I’m assuming this dress is a result. Now here’s where the book really shines. 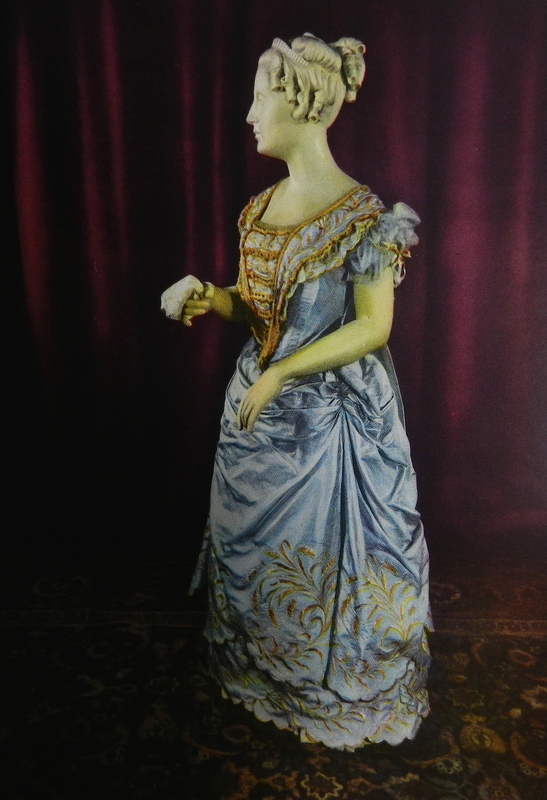 This gorgeous dress, worn by Mary Harrison McKee, was worn for a photograph and her presidential father’s inaugural ball in 1889. It’s olive, ivory, orange and silver … the last four colors I’d think go well together, perhaps. And it’s so beautiful! I want this one too. So … yeah, lots of cons to this book. It’s of its time, I suppose, and seems to rely only on family/owner say-so for dress provenance, instead of research. Some of the pieces in this book don’t seem to be anywhere online, so it’s interesting for that. That being said, none of the gowns are displayed particularly well, and many are really, reeeaaalllyyy off. Buy it? Yeah, if you find it for a few dollars. It’s an interesting if kind of cringe-worthy read. It’s got a few gems in it, though, so for that, it’s worth it. I have handfuls of patterns that I’ve taken from originals, or adapted from originals. I’m thinking of posting a handful of them. Very soonish, I’m posting an adapted mid-18th century small cap pattern, a ca. 1900 corset cover pattern (about a dress size 4), and 1930/40s high or low spats pattern. Here’s why I’m writing this particular post. I also have a ca. 19-teens silk jacket in a loose-fitting dress size 0-2, and my own 1920s feed sack dress pattern from this original dress, which is about a dress size 6-8. I also have a size 2-4 way-too-many-gores skirt pattern from the 1900s. These patterns will take a little more work to get online, especially the skirt. Would anybody like to try them? They’ll be formatted as images to download – measured drawings on graph paper, with instructions and a link to a page of detailed images of the originals (except for the cap) Let me know as a comment! Last night my order from Burnley & Trowbridge came in (yayyy!!) so I was able to finish my dad’s new work apron. My dad and I often wear aprons when we do shows. We sell metalware, which is oiled before it’s packed for a show – and then needs to be wiped down when we set up. So we don’t need heavy work aprons, really, just something to protect our clothes as we’re setting up the table. Dad had an apron made from heavy canvas in an eye-poppingly wide navy and white stripe. It didn’t fit very well and was so heavy it pulled his waistcoat down. It was also old and pretty dirty – oil doesn’t wash off so well. 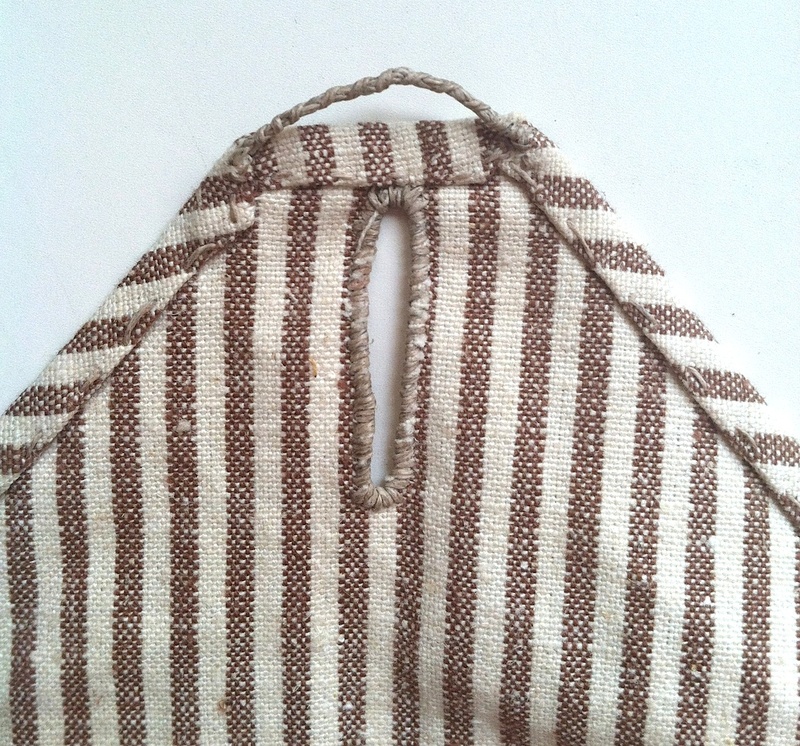 His new apron is made from a lighter cotton-linen blend in a white and coffee-brown woven stripe, with thin cotton ties. I hand sewed it with linen thread. It’s a simple design; the top is a triangle and the bottom just extends into a square (but it’s cut in one piece). I hemmed the edges, added a buttonhole and a loop at the top corner, and two ties at the hips. There’s no way to make this thing look decent if it’s not on a person. A buttonhole that behaved and went together well! I’m always thankful for that. 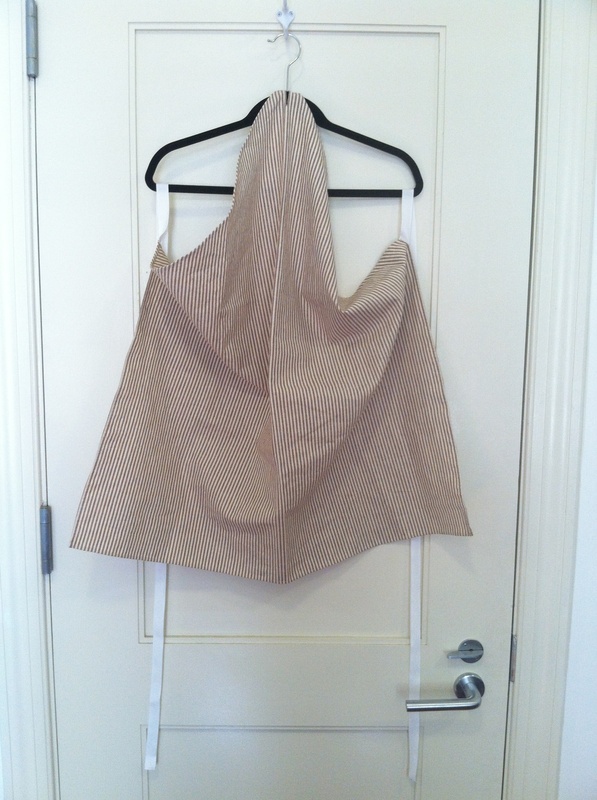 I added a waxed linen loop at the top, for hanging and just in case the buttonhole didn’t let the apron fall correctly. It’s probably superfluous but whatever.